Yeah…. Those filthy drip pans are mine. The oven is just the last thing on my mind to clean but, well, let’s just say it got to that point. I needed a method with little effort though because I hate cleaning, and this, I’m pleased to say, was definitely it! 2. Remove drip pans from vinegar mixture. 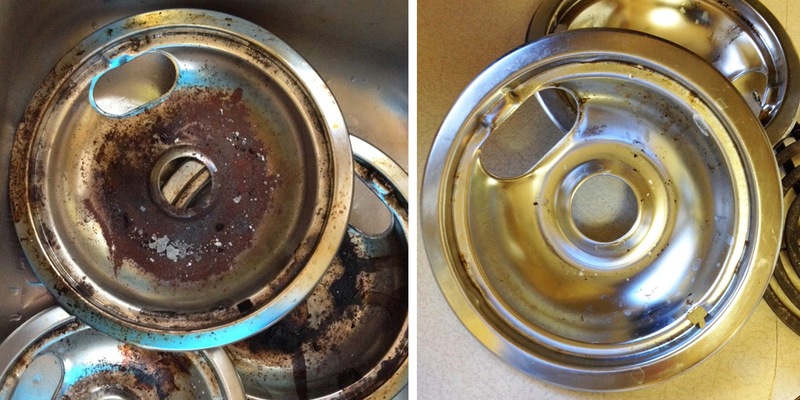 Pour baking soda on drip pans and spread evenly over the entire surface. Let it sit for one hour. 3. WITHOUT rinsing off baking soda, use a scrubber to “scrub” the baking soda mixture off. The filth will magically come off with it! 4. Rinse under water and admire your sparkling drip pans! *If they are not quite as perfect as you want them to be you can repeat the process. But… my words of wisdom to you would be they’re clean enough! Go do something fun! I'm pinning this! My pans are disgusting! Thanks for sharing! Oh I just cleaned mine this past weekend and they were a pain. I will have to use your tips for next time! Thanks for linking up to The Creative Exchange Linky Party! This works amazingly well! Thanks for a GREAT tip! I'm going to have to give this a try! We'r moving soon, and I usually just buy new drip pans when it's time to move. Thanks for sharing @ Submarine Sunday! I did just the vinegar step and I was amazed. Had to do some minor scrubbing on the edges with baking soda, but I have never gotten the pans this clean. Thank you!!!!!!!!!!! we love hearing about your success! Woo Hoo! 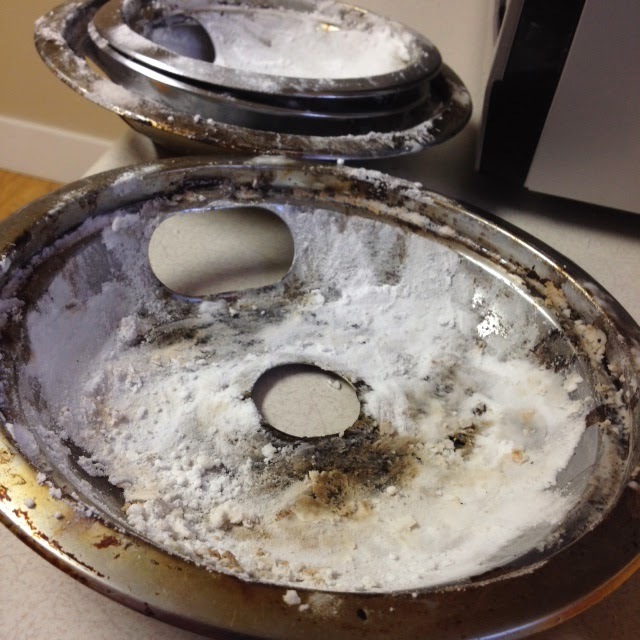 Just wanted to say “Thanks!” The apartment we moved in to had probably never had the drip pans cleaned….they were SO GROSS!! Your method worked like a CHARM! It did require a bit of elbow grease, I’m not gonna lie…but honestly, it was a small amount of effort for a LOT of SHINE!! THANKS AGAIN! Well I’ll be damned!!! It works!!! I was skeptical of it but was pleasantly surprised. I will say I was impatient. I only left baking soda on 1/2 hr but it still removed almost all the crud with little effort. I will be doing again and waiting the full hour. Thanks!!! I use no fume oven cleaner. Just spray it on, wait a few minutes, and wash them clean.